After breakfast we board our transport for the 1 ½ hour drive to the trailhead. For 45 minutes, the road south crosses the empty plains, the outline of the High Atlas becoming gradually more apparent. After another 15 minutes there is a turn off to Oukaimeden, Morocco’s largest ski area, and then it is half an hour through the increasingly lush Ourika valley to Setti Fatma. This trailhead at the eastern end of the High Atlas has always been popular with the Moroccans but foreign tourists traditionally have centred around the increasingly busy town of Imlil. The fertility of the valley is immediately apparent with stores selling boxes of apricots, plums, melons, cherries, oranges and apples. Restaurants on the far side of the river, accessible over precarious bridges, arrange their plastic seating in the shade of the fruit trees. 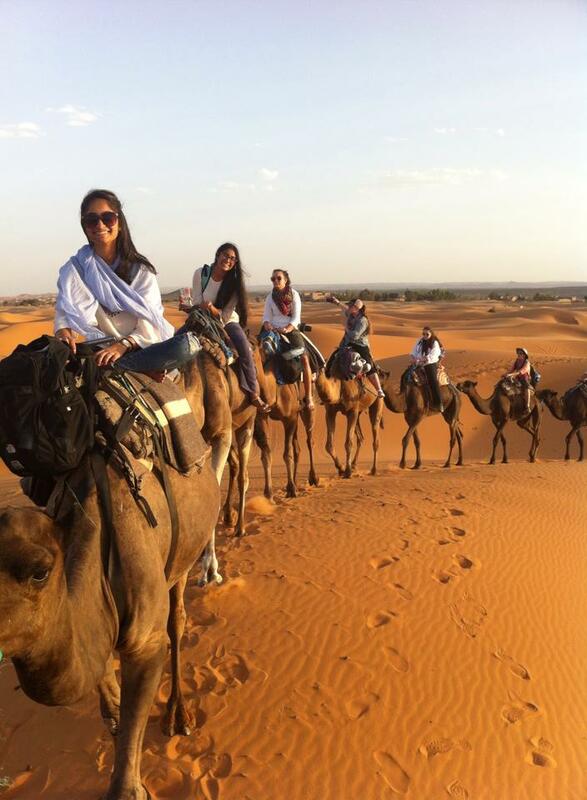 You will probably go on another km to end of the track at Agadir n-Ait Boulmane (1,498m/4,915ft) to pick up the mules. 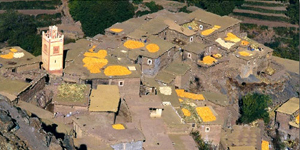 This is a more attractive Berber village, busy with women returning from the fields laden with bundles of long grass for the cattle. From here it is about a five hour walk to our first camp. The valley from here to camp at Assaka is along what the locals refer to as "the gorges". Whilst they are not by any means vertical sided, they are geologically unusual in the Atlas mountains, and in the spring the valley bottom becomes an intricate maze of irrigation channels making every possible square inch cultivable. The locals are happy to wander along the valley bottom enjoying the shade of the trees, the running water and the socialising. Of course this means a lot of walking along the sides of irrigation channels, hoping from boulder to boulder, and crossing bridges made of little more than sticks and rocks (and they can do this with their eyes shut). For us, the mule path is a better option, climbing well up out of the gorges and giving us our first views of the surrounding landscape. 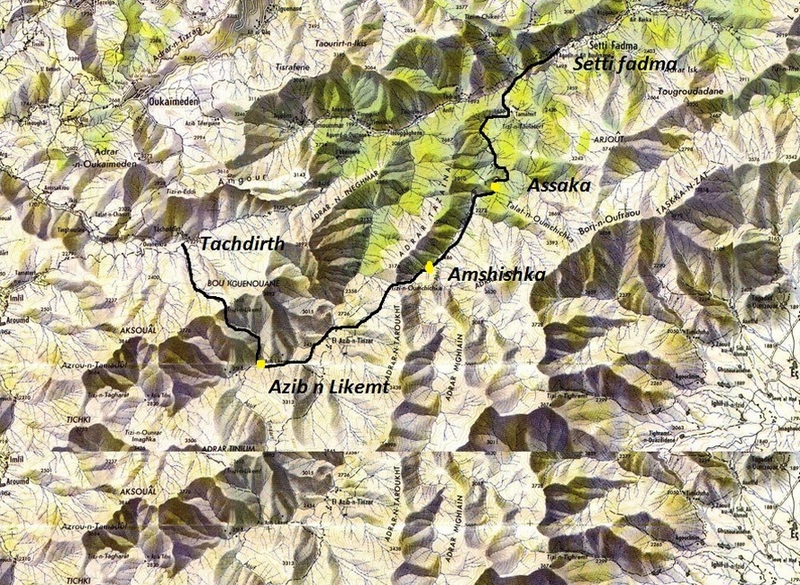 After 1¼ hours the valley splits with the right hand branch heading off towards Timichchi and Oukaimeden. We go left and soon after the mule track climbs high up on the left hand side of the valley. The berber village of Tamatert (1,655m/5,430ft) is reached after another hour or so, and by now the path is very much in the heat of the sun on the open hillside. The route up to the Tizi n’Tamatert is now very apparent and looks deceptively hard! A long hour, winding up through increasing numbers of Juniper trees, brings us to a pass on a rocky ridge with fine scrambly viewpoints. From here, the short trek back down into the valley is clear, as is tomorrow's climb back up and over the Tizi (col) n’Amenzil. It is only half an hour down to camp where the muleteers will be set up, and ready to greet you with a glass of berber mint tea! About 5 hours walking. NB : on lucky days, its possible to see colonies of monkeys feeding on walnuts. It is an hour 1/2 up to Tizi Amenzal, climbing quickly through juniper trees, whilst the view of yesterday's walk opens up. The first col isn’t quite the top, that comes five minutes later with a fine view of the village of Amenzal just a few minutes away, and a long green terraced valley stretching out beyond. Up on the peak to the right is a tiny weather station designed to warn Setti Fatma of potential flash flooding down the gorges. Amenzal is rarely visited by tourists, and we may be invited into one of the houses to share mint tea, walnuts and bread dipped in olive oil. In the winter months snow reaches down this far making life especially difficult. Early morning after breakfast, we cross the river then start our walk through fields of barley and small cabane for animals, after an 1hours on lush green slppes our trail become more steep and slow ascent to the pass at Tizi Likemt (3,555m). The going is quite tough as there is a considerable amount of loose scree on the ground. 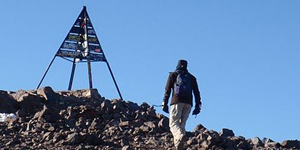 At the top we enjoy amazing and fine view of the Toubkal massif before a long downhill descent to the village of Tachdirth where lunch will be served prior to say goodbye to your berber team and drive back to Marrakech. This trek runs from June to October and can depart at any date of your preference. We usually have several treks departing each week that you may join , please get in Touch!! The accommodation will be camping, so this trek is only available from May to October.